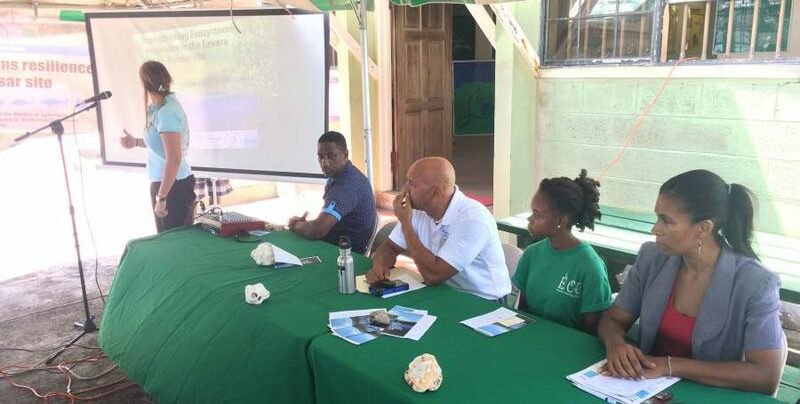 2 February 2017 was observed as World Wetlands Day in Grenada and across the globe. The focus this year was on “Wetlands for Disaster Risk Reduction.” World Wetlands Day is an opportunity to globally stimulate awareness of the importance of our wetland environments and to promote individual, community and national action towards sustainable use and management of these resources. Wetlands are land areas that are saturated or flooded with water either permanently or seasonally. Some examples of the wetlands in the tri-island state include; Levera area, Lake Antoine and the Grand Etang lake, Telescope and Conference Bay marshland and mangroves, Woburn marshland/mangrove areas, Petite Carenage swamp, Tyrrel Bay and Lauriston marshland/mangroves. Levera is recognised as the first protected wetland under the Ramsar convention and has also been designated by Prince Harry as a Queen’s Commonwealth Canopy Site. This internationally acclaimed wetland covers over 518 hectares with seagrass beds, coral reefs, and a freshwater pond in the in-filled caldera of an ancient volcano, surrounded by red, black and buttonwood mangrove species. The site is important for wildlife and turtle nesting and is culturally important for fishing and hunting as well as recreational pursuits such as picnicking, swimming, fishing, camping, sports, and turtle watching. Far too often, we equate wetlands with wasteland; a place to be drained, filled in, burnt off and re-purposed. The theme “Wetlands for Disaster Risk Reduction” highlights the importance of wetlands to help promote overall resilience to extreme events like hurricanes, floods, storm surges, and drought. These events are predicted to be exacerbated by climate change and will affect our daily lives. Wetlands play an important role in coastal protection by reducing the speed and height of storm surges. Wetlands help replenish the groundwater aquifers that are an important source of fresh water for us all. Wetlands also purify and filter harmful waste from water so that what reach our coral reefs is much cleaner and free of sediment and pollutants. They are fish nursery grounds, where many economically important fish species spend part of their lifecycle. In Grenada, many different types of food are harvested from our wetlands e.g. crabs, manicou, tatou, and iguana. Wetlands absorb atmospheric carbon dioxide which is important combatting climate change. Finally wetlands support key biological diversity. For instance, Levera wetland is a nesting site for the critically endangered Leatherback and Hawksbill turtle as well as our endemic Hook-billed Kite.